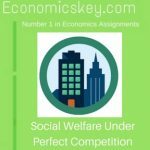 Under conditions of perfect competition. the producer in order to have the minimum lost combing ion of the factors to produce a given output tries to equate the marginal ate. of transformation between two factors to the ratio of their prices. At equilibrium we know, this condition is satisfied. Hence the condition about the Pentium allocation of factors is also satisfied. Tile producer under perfect competition. in order to maximize his profits tries to quite the marginal rate of transformation between the two commodities to the ratio f their prices and at equilibrium this condition I met Thus the condition about the optimum utilization of factor is satisfied. know that at equilibrium. the marginal rate of Tucson between the two commodities is equal to the marginal rate of transformation between the two commodities and both are equal to the ratio of their prices. Therefore. the condition bout the optimum direction of production is also satisfied. Under perfect competition’. 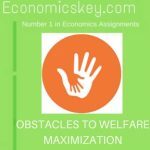 a factor will be utilized to the point where the marginal ate of substitution between employment of the factor and its leisure equals the rate f payment made to it. Similarly. with a view to maximizing his profit. 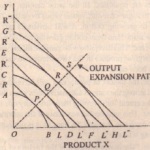 a producer equates the marginal rate of transformation between the factor and its product. nice the price of the product is the same for all the producers and the rate of payment is the same for all the fact of units the condition of optimum allocation of factor unit’s time is also satisfied.